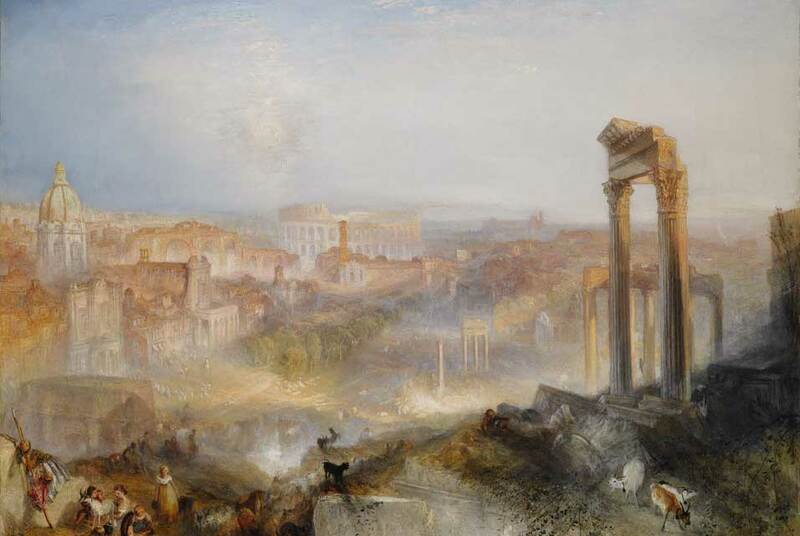 Sotheby’s announced that in its Evening Sale of Old Master and Early British Paintings in London on Wednesday, 7 July 2010, it will present for sale Joseph Mallord William Turner RA’s great masterpiece Modern Rome – Campo Vaccino, with an estimate of £12-18 million. Painted in 1839, this breathtaking painting shows the artist at the height of his technical powers and is undoubtedly among the most important of Turner’s works ever to come to auction. The painting is further distinguished by its immaculate condition and impeccable provenance, having only appeared on the open market once in the 171 years since it was painted. The picture was bought by the 5th Earl of Rosebery, and his wife Hannah Rothschild, in 1878 and has remained in his family collection ever since. This uninterrupted provenance ranks this work as perhaps the most important of only five comparable major Turner oil paintings remaining in private hands today. The auction of this painting presents an astonishingly rare opportunity. Arguably Turner’s finest depiction of an Italian city, this sun-filled panorama represents the culmination of the artist’s fascination with Rome, a fascination which lasted a period of more than 20 years. Turner was fascinated by Italy – like many of his contemporaries and predecessors – and it was a country which provided him with a rich source of subject matter, particularly given his interest in the rise and fall of civilizations. Modern Rome – Campo Vaccino is his final painting of Rome and the monumental work, which measures 90.2 by 122cm (35.5 by 48 in), brings together all of the studies that he made during his two visits to the Italian capital. One of Turner’s most compelling landscapes, when he first exhibited it at the Royal Academy Turner chose to accompany the painting with lines from Byron’s Childe Harold’s Pilgrimage: “The moon is up and yet it is not night,/ the sun as yet divides the day with her.” However, Turner has done much more than merely capture the city lying in a moment between day and night; he has fused the city’s modern life with its historic past. Through meticulous attention to detail and a brilliant and bold use of colour he has recreated a sparkling city bathed in atmospheric light. The painting evokes the very essence and qualities of an Eternal City. For the painting, Turner has taken as his viewpoint the top of Capitoline Hill and from here he depicts a scene that unfolds as the spectator’s eye first engages with the Forum, flanked by the Arch of Septimus Severus, the Temple of Saturn and the Coliseum. Beyond the distinctive shapes of those familiar buildings, the great arches of Diocletian’s Baths come in to focus on the left of the view and the distant landscape around the city captures the silhouette of St John Lateran clearly visible on the skyline. The dreamlike vista combines and presents us with the glories of the past; classical antiquity (with the remains of ancient Rome), the Rome of the Renaissance and Baroque and the seat of the Papacy while daily contemporary 19th-century life in the city – with its goatherds, religious processions and people simply attending to their business – takes place in the foreground. The painting’s first owner was the Scottish landowner and collector Hugh Munro of Novar, Turner’s close friend and supportive patron during the 1830’s, who acquired the work directly from the artist’s Royal Academy exhibition of 1839. Novar was one of the greatest collectors of Turner’s work and the only one of his patrons to travel with him to Italy. Modern Rome remained in Novar’s collection for almost 50 years until sold in 1878 by his executors. The Earl of Rosebery (1847-1929) and his new wife Hannah Rothschild acquired the painting at this auction, while on their honeymoon, for the staggering sum of 4,450 gns. The picture has since descended through the family of the 5th Earl of Rosebery. The picture’s exemplary provenance is further enhanced by its exhibition history and inclusion in a vast body of literature on the artist. The painting has featured in no fewer than three exhibitions at the Royal Academy and has also been on public exhibition at the Victoria and Albert Museum, The Tate and more recently in the highly acclaimed JMW Turner show at the National Gallery of Art in Washington. It has also been on loan to the National Gallery of Scotland since 1978, and was recently part of their Turner and Italy exhibition in 2009, which travelled to Ferrara and Budapest. This entry was posted in 古典艺术 and tagged Italy, J. M. W. Turner, London, Painting, Rome, Royal Academy, Sotheby, Turner. Bookmark the permalink.